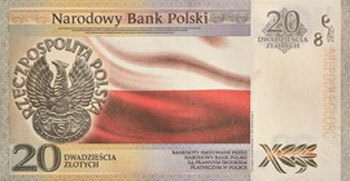 Poland – New commemorative banknote. The Narodowy Bank Polski issued yesterday August 31st a new 20 zlothych commemorative banknote (PLN20.9) honoring the Centennial of Polish Independence. 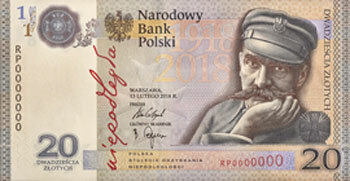 The banknote shows the portrait of Józef Pilsudski in the front, and the Polish flag in the bag. Its size is 150 x 77 mm and it is sold at a premium, so it is not intended for gereal circulation, although it is legal tender. The quantity to be isuued is 50,000 notes. to see the brochure that describes the historical background and details of the banknote.